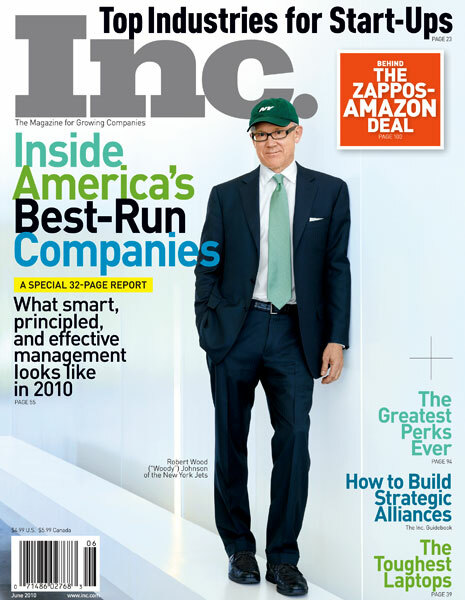 Never really have been an Inc. Magazine reader, but will likely become one after seeing a couple of good pieces from the June 2010 issue. I decided to read Inc. after seeing a link on Twitter to the contained in this issue book excerpt "Why I Sold Zappos" from CEO Tony Hsieh. Compelling enough stuff that I went and got Hsieh's book ""Delivering Happiness" and posted about it here. 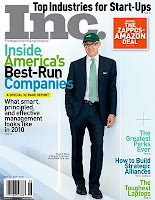 Also from this issue of Inc. was "The Way I Work: Blake Mycoskie of Toms Shoes" about the CEO. It's an interesting piece that charts how the 33 year old founder spends his time. Mycoskie appears quite the fascinating guy who has built a growing company which is also doing good... as evidenced by it's policy of giving away a pair of shoes for each one sold. I found myself interested in his mention of being a reader of business biographies given that Mycoskie's personal story is one I'd want to read. One other compelling piece from this issue was from Jason Fried, the head of a software firm called 37signals. Titled "Never Read Another Resume", it's about Fried's views on staffing a company and has a couple really solid insights. The first is that someone hiring for a position should spend time actually doing that role. One reason is this helps ensure that the hire is based on actual rather than just perceived need for another resource. Additionally, this idea of a hiring manager doing the job being hired for helps determine exactly what's needed in someone. Another insight from Fried is the driver behind the piece's title and all about cover letters. Idea is that they should be a bigger determiner in hiring decisions than actual resumes. Reason being that the cover letter reveals more about the applicant. In particular, the cover letter can reveal how well someone can write and how much they really want the job. To that end, Fried links to a website all about wanting to work for 37signals put together by a recent hire. Solid and very interesting stuff.